Final Salute Corporal Groves. Thank you for your service. You are a hero. Rest peacefully in the presence of God. We are praying for the family and fellow officers. On behalf of the Ohio Bureau of Identification & Investigation our thoughts and prayers are with the immediate family of Corporal Daniel H. Groves and the extended law enforcement family of the Colorado State Patrol, Colorado. End of Watch Wednesday, March 13, 2019. Rest In Peace brother ! Dan, it was good knowing you my friend. Rest peace fellow recruit class member. It was good keeping in touch with you after all these years. We will take it from here brother. 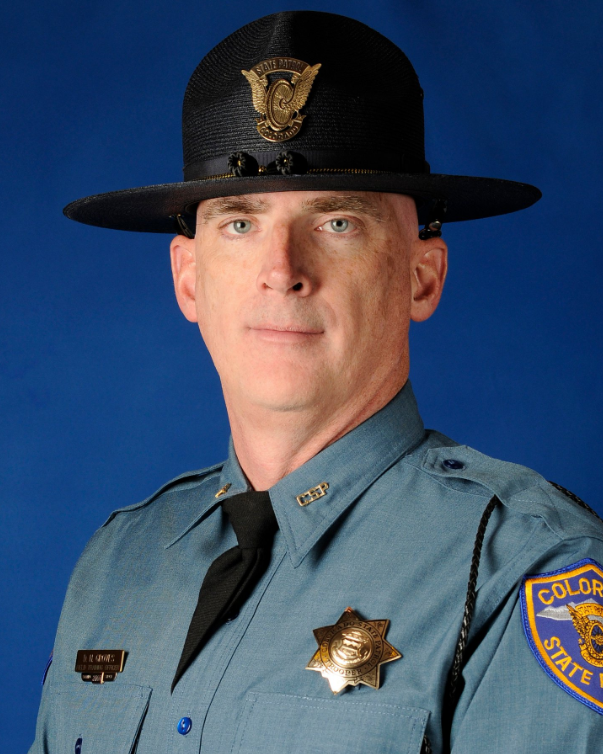 Deepest Sympathy to the family of Trooper Groves and to the Brothers and Sisters of the Colorado Highway Patrol. May the Lord comfort his family, His co -workers and his Brothers and Sisters, during this time of grieving. May he Rest In Peace. Thank you for serving I wish your Brothers & Sisters love and all your family all blessing thank you for risking your life for others thank you so much thank . Rest in peace, Corporal Groves. You deserve your divine reward. Lord God, our hearts and prayers go out to the Colorado State Patrol and for the family, friends, and colleagues of Corporal Daniel H. Groves, of the Colorado State Patrol, who was killed in the Line-of-Duty on Wednesday, March 13, 2019. Depart, dear brother-in-blue, out of this world into the arms of the Father who created you, into the arms of the Son who redeemed you, and into the arms of the Spirit who made you whole. You fought the good fight. Now rest in peace. Amen. Dan, it was a pleasure working with you and blessing to know you. It’s always hard to digest these things, especially when it hits so close to home. Be our guardian angel and watch over us as we push forward to do the things that need to be done. Your place in Heaven is secure brother. Rest easy Brother for we shall hold the watch. God Bless you Corporal Daniel Groves for your service and sacrifice. Thoughts and prayers go out to your family and friends, and to your brothers and sisters from the Colorado State Patrol. Rest In Peace Brother. A police officer should be remembered not by how he died, but how he lived! A great man has gone to secure a safe path for the rest of us to follow. Thank you to you, your family and the Colorado State Patrol. Our country is a little less safe without you. Rest in Peace Brother!